Kanchanaburi, Life, Thailand, Travel, WTF! For starters, I made a major move from Malaysia to Thailand. It seems like a decade ago, but it was just last April. And then, soon after arrival, I started making both long and short trips around my new country, while at the same time grappling with the new rules, regulations, people, language, food and a whole host of other differences. But most of these things I’ve written about already. It’s the travel I’ve really enjoyed, and there’s one trip in particular that really sticks in my mind – I think not because it was my last long trip – but probably because it was my most memorable one for quite some time. It was my short visit to Kanchanaburi, where I had a chance to visit part of the so-called Death Railway, a couple of the military cemeteries and museums. Actually, the trip was too short. There were things I missed. I may be able to add to my experiences next month when I will be spending two more nights there. But I’m afraid work commitments may prevent much touring. We’ll see. The railway was built in 1943 by the Empire of Japan as the Thailand-Burma Railway, or the Burma-Thailand Railway depending on the nationality of the person you ask. It was originally 415kms. long, but much of it was bombed by the Allied Forces, to prevent the Japanese escaping through Burma, and the line was closed in 1947. Eventually a section in Thailand was reopened in 1957, and runs between Nong Pla Duk and Nam Tok. It’s now only 130kms long. For me, the main reason for visiting the railway was to try to understand the horrendous conditions under which it was built. An estimated 130,000 men died. A mixture of local laborers and prisoners of war. And they were all men. The women sadly were used for a different purpose, which I’ll leave to your imagination. There were very few tools available, and the men were made to work, sometimes for days on end without a break, hacking rock almost with their bare hands to flatten the land in what is very mountainous scenery. The cruelty was just unbelievable. Men worked until they dropped, or were shot. In one section of railroad known as Hellfire Pass, an estimated 70% of the workers died. The statistics are almost inconceivable. Yes, it’s a humble railroad tie, or sleeper, if you prefer. To lay that one tie, a man died. And another for the next tie, and so on, and so on. That was the average death rate. One man per tie. Take another look. One man per tie! 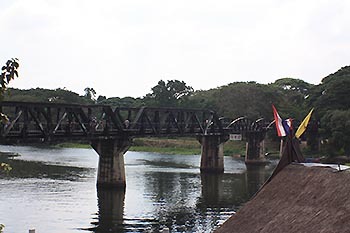 Today, the line is best known for the famous Bridge over the River Kwai. I walked across it. It was a humbling experience. In fact the whole railway is something you experience, not enjoy. For me it’s strange looking back on the post-war years. It was a World War after all, which meant just about everyone in the world was affected in one way or another. Homes were lost. Friends and relatives were killed or badly injured. Returning prisoners of war were emotionally scarred for life. Economies took decades to recover. Some still haven’t. My experience, being British by birth was to be told as a young lad that I should hate Germans, Japanese and Jews. The last one might seem strange but the whole Palestine conflict and the creation of Israel was a big mess the British didn’t need, coming straight after a world war. I could understand the hatred, but I couldn’t see why that should influence my thinking. It wasn’t my war. When I was told to hate, I was too young to understand why. And when I was older if I met a German, Japanese or Jew, there was every probability they weren’t involved in the war either. I spent a good chunk of my early career in the airline industry, and a large part of that attending meetings, where delegates could be of any race, nationality or religion. As I look back now, I realize I didn’t dislike any of them, especially not the Germans, Japanese, nor the Jews of whatever nationality. Deep down people are all the same, wherever they are from. And yet, we are all shaped by our upbringing, and so on the surface can seem very different. That’s what makes life interesting. It’s not a reason for hatred. As I think back now, I remember at one time being very interested in a young German girl who attended many airline meetings. I think the feeling was mutual, but nothing became of it because she was transferred to someplace in South America. Which is probably just as well because I doubt my father would ever have spoken to me again if he’d found out! He was less than impressed when I bought a BMW! And I recall there was a Japan Airlines delegate at one meeting who I chatted with the day after the meeting, in the departure lounge at Geneva Airport. We were both heading to London, so I asked politely if he was en route to Japan. “Errm, excuse me?” I replied, looking bemused. So, he repeated this very carefully thinking the gaijin must be a little dim, or had drunk too much red wine the night before. Actually the latter was a given. At which point, thankfully, the flight was called. We were not sitting in the same row, and so the confusion ended. But, that was just one encounter with a Japanese person, all of who I have found to be friendly and polite, if a little wary of us strange foreign devils. At one point in my entrepreneurial career in Canada I did some business with a colleague who was German by birth. Nothing unusual there. More than 20% of Canadians were born outside the country, and almost all can trace their ancestry to foreign parts. But we’re all Canadians first, and our birth or ancestral nationality is an important but distant second. I can’t remember why, but one evening we found ourselves in a restaurant in Toronto, a Mövenpick I believe, which meant it served some European food. My friend took great delight in introducing me to something called matjes herrings, which are basically young marinated raw fish. And each time we ordered a plate, we also ordered a bottle of white wine, so it wasn’t just the herrings that were soused! Now, no matter how much Basil Fawlty says “Don’t mention the war” when you put together two people of a certain age, the war inevitably creeps in. 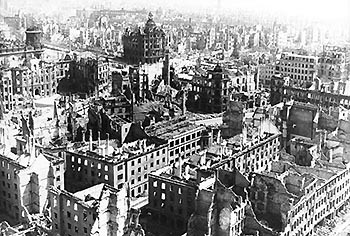 The City of Dresden in 1945. More than 90% was destroyed. You see, my friend was some dozen-or-so years older than me. He had been raised in Dresden. The city was heavily bombed many times during the war, but inexplicably and devastatingly so when it was obvious the war was in its final months. It seemed about as unnecessary as the second atomic bomb on Japan, and arguably the first. We debated this, and many other aspects of the war. But the thing that has stuck in my mind, just as the experience of the Death Railway will do, is my friend’s description of his part-time job. He made pocket money collecting human body parts after bombing raids, many of which he said could be found just about anywhere … in drains, hanging in trees, or on rooftops. It was a highly moving conversation. I was left with a complete lack of understanding as to why a young teenager would have to do something like that, just as those men in Kanchanaburi should have had to die to build a a railway. How men can see the wisdom in a war.